The utopian dream of human perfectibility demands conformity of thought and action. The Chinese Cultural Revolution – a terrifying decade of totalitarian purging of everyone and everything that did not conform to Maoist ideology – ended in 1976. But everything old becomes new again, so welcome to the new Cultural Revolution which is not on the rise in China but instead is eroding the freedoms of the Western world. The architects of the Chinese Cultural Revolution employed the ruthless tactics of totalitarianism everywhere: public humiliation, capricious imprisonment, hard labor, torture and execution, the seizure of private property, and in China’s case, the forcible displacement of much of the young urban population to rural regions where they and millions of others were starved to death. And just as Muslim supremacists strive to erase any pre-Islam cultural and historical artifacts in conquered territories, the Chinese revolutionaries attempted to wipe the slate clean of pre-Communist history as well, ransacking cultural and religious sites. Certainly such abuses are not underway in the democratic West – yet. But a similar totalitarian impulse is on the move among the radical Left. In America and England, for example, historical relics and artifacts are being destroyed as college activists radicalized by the Marxist professors who dominate Humanities departments clamor for the removal of monuments to the “slave-owning” Founding Fathers, to “colonialist” giants like Cecil Rhodes, and to “mass murderers” like Winston Churchill. What has been the West’s response to such assaults on its cultural heritage? For the most part, it too often has been self-censorship, naval-gazing self-loathing, and apologetic compliance. The Left’s loud denunciations of so-called white privilege, colonialist imperialism, and cishetero-normativity have resulted not in pushback but increasingly in pre-emptive confessions of racial sin and gender intolerance. National Geographic, for example, issued an embarrassing mea culpa recently titled, “For Decades, Our Coverage Was Racist. To Rise Above Our Past, We Must Acknowledge It,” in which the editor admitted the magazine’s long history of a self-described “colonialist” perspective in articles and photo layouts featuring racial caricatures. “It hurts to share the appalling stories from the magazine’s past,” she wrote. But having confessed, the magazine had earned permission to move forward cleansed of its past transgressions. The only shameful use of racism as a political strategy is on the part of the Left, which has made race-obsessed identity politics the spearhead of its ideological offensive, and against which Donald Trump’s rise to the White House was largely a reaction. Identity politics has degraded every aspect of our politics and culture – no national conversation is free anymore of its ugly, race-mongering, gender-denying, intentional divisiveness and relentless accusations. In another poster, Secretary Treasurer Linda Minnabarriet poses with arms folded next to her quote, “I lose an opportunity if I don’t confront racism.” More to the point, she might lose her job if she doesn’t confess to her own racism. 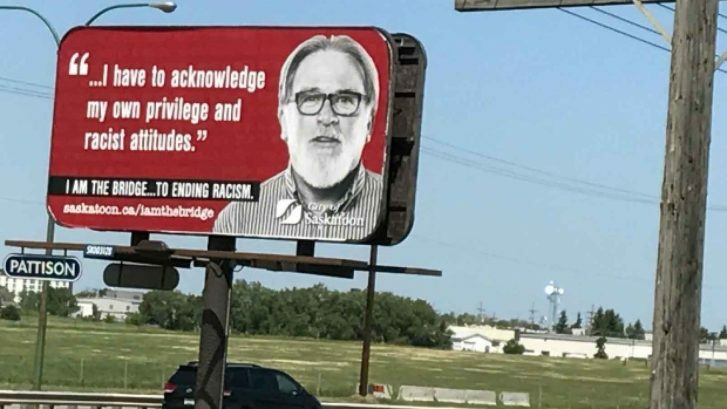 This controversial Canadian campaign, which has local parents riled up, was modeled after another self-flagellating campaign on Saskatoon billboards, one of which featured the image of an older white male accompanied by the quote “I have to acknowledge my own privilege and racist attitudes.” Have to – or he will be ground up beneath the wheels of the new Cultural Revolution. “We do understand that this is a discussion about race and privilege, and it can make some people uncomfortable,” says Superintendent Downs. Actually, what makes people “uncomfortable” about this “discussion” is the blatantly racist assumption that all whites are inherently, irredeemably bigoted and benefit from privilege. That assumption means it’s not a “discussion” but an ideological imperative which Downs and similar-minded educators are inculcating in students over the objections of their parents. “Disrespectful objection to the professor’s class discussion structure; refusal to stop talking out of turn; angry outbursts in response to being required to listen to a trans speaker discuss the reality of white male privilege and sexism; disrespectful references to the validity of trans identity and experience; [and making a] disrespectful claim that a low score on any class work would be evidence of professor’s personal prejudice” [emphasis added]. Notice that the instructor considers “white male privilege” an indisputable “reality” and “trans identity” indisputably “valid.” The video she showed and its content were therefore for ideological purposes, not educational ones. Lake Ingle bucked the indoctrination, and so the school now expects him not merely to apologize, but to be degraded before Professor Downey and his classmates. “Lake will write an apology to the professor which specifically addresses each of the disrespectful behaviors described above,” the form reads. He is expected to “acknowledge how his behavior has significantly damaged” the classroom learning environment, and “explain how he will demonstrate respect for the professor” and his fellow students in the remaining sessions. But most illuminatingly, “Lake will begin class with an apology to the class for his behavior and then listen in silence as the professor and/or any student who wishes to speak shares how he or she felt during Lake’s disrespectful and disruptive outbursts on 2-28” [emphasis added]. So it is not enough to correct the student’s errant thinking – he or she (or should I say “xe”?) must submit to public humiliation and bear it in silence, to provide the mob of humiliators a safe space from which to verbally degrade the offender. This is straight out of the Chinese Cultural Revolution playbook. Such is the sado-masochistic totalitarianism at the heart of the Left. Their utopian dream of human perfectibility demands absolute conformity of thought and action, as well as absolute submission to their authority. And therein lies the solution to ending this burgeoning new Cultural Revolution: stand against it. The free West has lost ground against the resurgence of Communism, rebranded as Progressivism, because it has simply allowed itself to be overrun. It can turn the tide by opening its eyes and fighting back. Stand by the truth and refuse to buy into the Left’s linguistic manipulation. Do not tolerate their intolerance. Reject their demonizing labels. Push back against their violent bullying. Resist as relentlessly as they attack. Easier said than done, but the alternative is surrender to an enemy that will show no mercy. Remember Oliver Cromwell and his tidy up of Parliament. Alternatively a peasant’s revolt storming the Beehive. Two NZ MP’s ( Tamati Coffey and Chloe Swarbrick) also went on that anti-gun march, claiming to represent NZ, on a 9 day trip to the USA courtesy of the tax payers. Some of us have seen this coming a long way off but the marxists hold all the key aces….education and ministry of propaganda. Not a dogs show. There simply aren’t enough people with courage in NZ to stand and make a difference. I placed an item in the paper asking for people interested in making a change in Tauranga at the coming elections. I received three replies. I contacted the three people and I never heard from them again, so what chance have we got? NZ is doomed. There are too few who will stand up to be counted in NZ. There hasn’t been one mention of how many TV shows seem to have a % of gay people, dark-skinned people, and other sundry people with differences. Now should there also be a % set number for what we would call normal people? Oh no! That would be either racist or gay bashing or some other silly PC pseudo-crime. For a horrifying local example, just read today’s STUFF news article by Chris Trotter on Colonisation and Racism. Trotter succeeds in proving that attitudes like his cause racism. There is a lesson here for New Zealand, particularly in regard to the deliberate misrepresenting of the Treaty of Waitangi. There is a more immediate racial objective, while another sector of the population is assisting the process in order to create conditions that will eventually facilitate a religiously motivated constitutional change in New Zealand, namely severing our relationship with the Crown, or in other words booting out the Protestant queen and the Westminster system of government from the constitutional framework of New Zealand. As far as New Zealand is concerned, it will undo 400 years of British history. If that sounds extreme, then just remember that it was the Roman Catholic solidarity movement in Poland led by Lech Walesa that that eventually destroyed the Soviet Union. Catholic territory was regained in East Timor, for which president Jose Ramos Horta was given the Nobel Peace Prize. The ideological destruction of the British Commonwealth is next, and a good place to start is New Zealand by cynically using racial issues in the service of religion. We saw this ugly process at the time of the springbok tour in 1981. Bishop Ashby of Christchurch declared that the protest movement was 80% Catholic, and it was reported in the New Zealand Tablet. The reason being that the Catholic Church had made huge gains in South Africa and Catholics here were deeply concerned about all those black Catholics. How did Bishop Ashby know that the movement was 80% Catholic? Easy. Catholic Action groups report to priests, and priests report to Bishops. We saw the same influence in the flag change issue. It was not a debate; it was a highly orchestrated campaign. The first step in removing a Protestant Monarchy is to remove the symbols associated with it. John Key’s position was ambiguous in that he brought back the Royal Honours system but supported the removal of another symbol, our flag. Protestant Britain will of course be the final target for ideological destruction. The Roman Catholic church thinks in terms of continents and centuries. Well, I’m guilty for thinking thank goodness I’ll be 6 feet under by the time this accelerating racism & group ignorance comes to fruition. Can’t say I feel too good leaving the world in a worse shape for our children, though.